My mother-in-law texted me and said, "There is an early birthday gift being delivered for Hoss (my husbands nickname) on Friday. It is perishable so I hope someone will be there. Well, she knows I am always home so that was no biggie, BUT she didn't tell me what the delivery was. Chris: George this delivery came and it is from Cape May Lobster House! George: Did you open it? Chris: NO, it is YOUR box, do you want me to? Chris: Should I take the tape off of the styrofoam cooler and open it? Chris- It looks like crabs, like HUGE blue claw crabs. Chris- WHOA, it looks like HUGE lobster claws! George- Are you sure it is just claws? How many are there? Chris- I don't KNOW George I am NOT touching them. It looks like 4 or 8. Chris- (screams) OMG, OMG, OMG, IT MOVED! 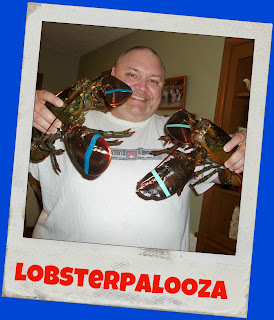 George- (hysterical laughter) It's lobster!?! George- Cover it back up with the newspaper and ice and shut the lid so they stay cold, because it makes them sleep. Chris- OMG, I hear it MOVING in there! Is it going to come through the cooler? George- Chris their claws are banded they aren't coming through. George- Are you going to name them and make them pets? Ok so it went something very close to this. I am not SO dramatic usually, especially over this, but I had NO idea what was in the box was alive and startled me when I had gotten in so close. Meanwhile, my husband has given me a list of what I need to get at the store to prepare the glorious lobsters his dad and stepmom sent him from his favorite lobster place from home, Cape May Lobster House. Anyone been there? I had never cooked lobster at home, in fact I only tried lobster a few months ago. Sad shame I learned I like it in Nebraska, and not back east, on the shore where it is the specialty! Anyway, considering the cost of lobster out here, I haven't cooked it at home since I learned I liked it. My husband decided it was time to learn and after aquiring his requested item for cooking and he got home from work, he set out to teach me. This is the method my husband uses. You may or may not like Old Bay Seasoning. He learned it from his father, and has taught it to our son who hopefully one day will teach his children! I love family recipes, methods and stories of the kitchen. You can use beer in this, or you can just use very salted water to mimick the sea water. He uses beer on crabs, but not lobster. 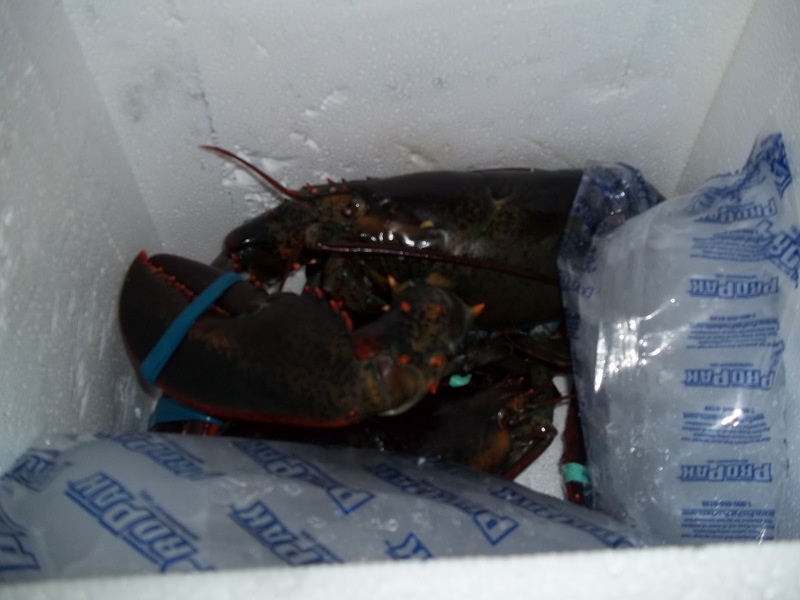 Here is what you will need to cook lobster OUR way! LOBSTER(S) These 2 happened to weight in at 5lbs and 5.5lbs respectively! And a stomach not too weak to put them in the boiling water alive. I know, I know, it disturbed me, until it was over and I was eating......Yum! Fill your pots with hot water and bring to a boil Add in approximately 1 tbsp of Old Bay for each quart of water used. We used less because we didn't want the flavor of the Old Bay seasoning to overpower the delicate flavor of the lobster we just wanted to enhance it. This isn't rocket science, just guess. You can also just add a couple of tbsps of salt to your pot. When they come to a rolling boil, drop the lobsters in head first, upside down if possible. Once the water comes back to a boil, cook until they are completely red. Our lobsters cooked 14 minutes at a rolling boil. Remember they were starting to cook already before they came back to a rolling boil! (probably 16 min in the water) Hubs let them carry over cook 3-4 minutes when they were done! Don't over cook or they will be so tough! He cooked them PERFECTLY! 1 1/2 lb Lobster/7-9 min. 3 lb Lobster/ 12-13 min. You will know your lobster is done when the shell is completely red. Don't worry about all the tricks and wives tales about pulling antennaes or anything like that. Just go with this guide!! I got an entire lesson on the cracking and cleaning of the lobster. We dipped them in melted butter. Neither of us are big on clarified, if you roll that way go for it! I recall snapping this as he was saying, OMG look at the size of this claw meat, I can't believe I got it out in one piece! I hope you enjoyed the drama, and hair raising experience this was. I have a video, but in the name of respect, I am not posting it. Besides all you can hear is me being a drama queen. Imagine that?!? Christine, you and your husband are adorable!